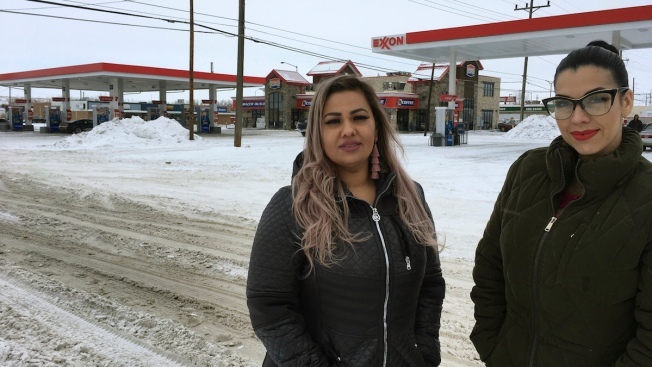 In this Wednesday, Jan. 23, 2019, photo provided by the ACLU of Montana, Martha Hernandez, left, and Ana Suda pose in front of convenience store in Havre, Mont., where they say they were detained by a U.S Border Patrol agent for speaking Spanish last year. The women have filed a lawsuit against the U.S. government and the border agent and are seeking a judge’s order barring U.S. Customs and Border Protection officials from stopping or detaining people based on race, accent or language. Two Montana women questioned by a U.S. border agent who overheard them speaking Spanish in a convenience store sued U.S. Customs and Border Protection on Thursday, saying the agent illegally detained them without reason. The agent held Ana Suda and Martha Hernandez for 40 minutes in a parking lot in the city of Havre in May 2018 without reasonable suspicion or probable cause, according to the lawsuit filed in U.S. District Court in Great Falls. His only reason for doing so, they said, was because they were talking in Spanish while waiting in line to buy milk and eggs. 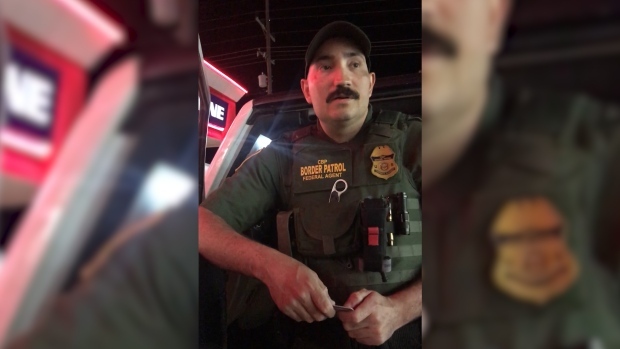 Suda took a video of the parking lot encounter with CBP Agent Paul O'Neill in which she asks him why he wanted their identifications. A U.S. Customs and Border Patrol Agent stopped two women, who are U.S. citizens, after overhearing them speaking Spanish at a Montana convenience store near the Canada border. "Ma'am, the reason I asked you for your ID is because I came in here and I saw that you guys are speaking Spanish, which is very unheard of up here," O'Neill said in the video. CBP spokesman Jason Givens said Thursday the agency doesn't comment on pending litigation. The women's ACLU lawyers say O'Neill should have let them go as soon as they identified themselves as U.S. citizens, but he instead detained them in violation of the Fourth Amendment barring unreasonable searches and seizures. The lawsuit also claims the agent targeted them based on their race in violation of the Fifth Amendment's due process protections. O'Neill and later his supervisor made it clear through their words and actions that the women weren't free to leave the parking lot, ACLU attorney Alex Rate wrote in the lawsuit. "Speaking Spanish does not establish reasonable suspicion justifying a stop and detention, much less probable cause for an arrest," Rate wrote. Suda and Hernandez are asking for an unspecified amount of money in compensation, punitive damages and a judge's order barring border officials from stopping or detaining anyone based on race, accent or language. Both women are Mexican-American and fluent in Spanish. Suda was born in Texas and moved to Montana with her husband in 2014. Hernandez was born in California and has been living in Montana since 2010. Both are certified nursing assistants who work at an assisted-living center. Havre is a city of nearly 10,000 people about 30 miles (48 kilometers) from the U.S.-Canada border and near two Native American reservations. The city's population is mostly white and about 4 percent Hispanic, according to the U.S. Census. In 2017, border patrol agents in the Havre sector made 39 arrests. Eleven of the people arrested were Mexican.